2. Name your nominated blogs (10-15 is the standard number). Notify them that you have done so. 3. Share seven things about yourself. 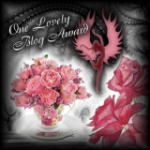 Thanks so much Alejandra from Love Bliss Life for nominating me for this award! It's super encouraging and awesome to know someone enjoys my writing. She has great style and a fun blog, so go check it out ! These blogs are so fun to read and I love checking out what their doing, so take a second to check them out if you wish! Congrats hun. Thanks so much for nominating me. I'm flattered.